tMushroom Model Publications (MMP) is based in the UK. All their books are printed by their associate Stratus in Sandomierz Poland. Stratus does MMP books in English and their own line of books in both English and Polish. This book is soft-cover of 80 pages in 8 1/4" x 11 1/2" page format. The cover art shows a T-34/76 from the 1st Polish Tank Regiment during a march-past for oath taking of the 1st Infantry Division 0n 15 July 1943. The tank is olive-green. On the turret is a white eagle with-out a crown. One corner of the cover says that there are more than 90 color illustrations in the book. I counted them and their are 91. The T-34 was a Soviet medium tank that had a profound and lasting effect on the field of tank design. Although its armour and armament were surpassed later in the war, it has been often credited as the most effective, efficient and influential tank design of the Second World War. At its introduction, the T-34 possessed an unprecedented combination of firepower, mobility, protection and ruggedness. Its 76.2 mm (3 in) high-velocity tank gun provided a substantial increase in firepower over any of its contemporaries; its heavy sloped armour was difficult to penetrate by most contemporary anti-tank weapons. When first encountered in 1941, the German tank general von Kleist called it "the finest tank in the world" and Heinz Guderian confirmed the T-34's "vast superiority" over existing German armour of the period. The T-34 was the mainstay of Soviet armoured forces throughout the Second World War. Its design allowed it to be continuously refined to meet the constantly evolving needs of the Eastern Front: as the war went on it became more capable, but also quicker and cheaper to produce. Soviet industry would eventually produce over 80,000 T-34s of all variants, allowing steadily greater numbers to be fielded as the war progressed despite the loss of thousands in combat against the German Wehrmacht. Replacing many light and medium tanks in Red Army service, it was the most-produced tank of the war, as well as the second-most-produced tank of all time (after its successor, the T-54/55 series). Its evolutionary development led directly to the T-54/55 series of tanks, and from there to the T-62, T-72, and T-90 tanks that, along with several Chinese tanks based on the T-55, form the backbone of many armies even today. Widely exported following the war, in 1996, T-34 variants were still in service in at least 27 countries. 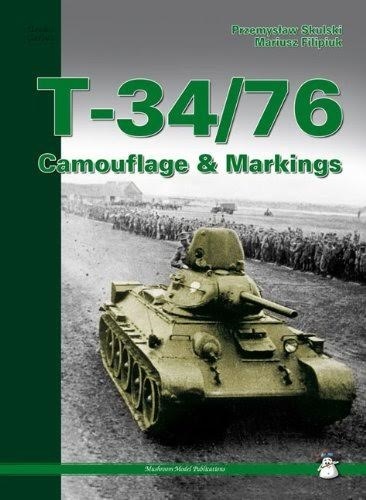 This book contains 77 black and white wartime photos, 13 color photos of restored T-34/76's in museums that includes 20 walk around type photos, there are 24 color profile illustrations, 8 2-views, 3 3-views, 14 color illustrations of tactical marks and color illustrations of turrets showing slogans and tactical marks. There ar twelve of these. Five are 2-views. Markings and colors are included for T-34/76's serving in the Soviet Union, Czechoslovakia, Finland, Germany (captured ones), Yugoslavia, East Germany (post WWII), Poland, RONA/ROA, Romania, Hungary and Italy. This is essential reading for armor enthusiasts and AFV modelers. Highly recommended. I has a wealth of color schemes in it to choose from. I want to thank Dr. Roger Wallsgrove Editor-in-Chief of MMP and the folks at Casemate Publishing who sent me this review sample. Platypus Publications is the Australian distributor.